Set in Australia in 1874, housemaid Hilda (Dunne) dreams of having a singing career. The mistress of of the household Mrs. Clarkson (Boland) also fancies herself as a singer, though she is terrible. Composer Sir Julian Kent (Tearle) is coming from England to Australia and Hilda wants to perform for him. Mrs. Clarkson also thinks singing for Sir Julian will be her break into opera. Outlaw Stingaree (Dix) also comes into town at the same time as Sir Julian and poses as Julian. After meeting and falling for Hilda, Stingaree is determined to help her become an opera star. -Turner Classic Movies premiered this film on their channel for the first time in 2007. “Stingaree” was part of a “Lost and Found” preservation series of RKO films produced by Marion C. Cooper. Other films in the series included with other films such as “Rafter Romance” (1933), “Double Harness” (1933), “One Man’s Journey” (1933), “A Man to Remember” (1938) and “Living on Love” (1937). In 1946, Cooper obtained ownership of the films and were shown on a limited re-release in 1955 and 1956 in New York City, according to Turner Classic Movies. 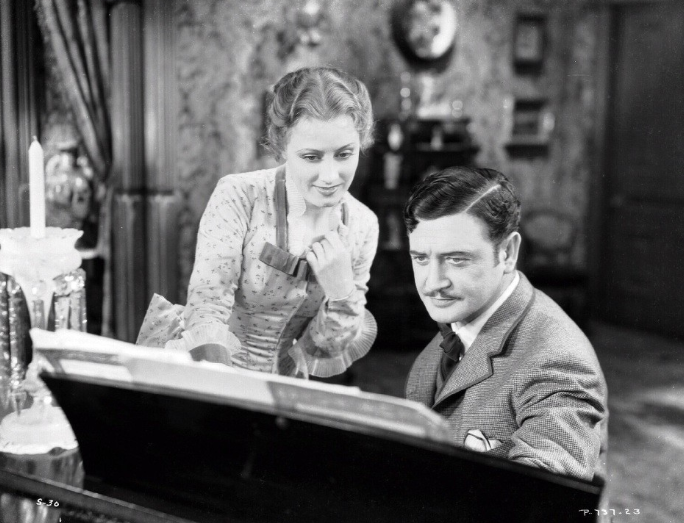 -RKO original considered Jeanette MacDonald in the film, on loan out from MGM. -Based on a 1905 novel by Ernest William Hornug. -For the opera scenes, the standing set from Lon Chaney’s “Phantom of the Opera” (1925) was used. *Mary Boland is singing at a party and Stingaree enters with a gun to hold up the party and allow Irene Dunne to sing. Sir Julian: My good man, being shot right now would be a favor. Mary Boland: I will not sing for outlaws! Richard Dix: Compassion for the outlaw! *Mary Boland:…Why, the very foundation of empire is woman’s virginity. Sir Julian: Chastity, madame, chastity. No empire would get very far with virginity. 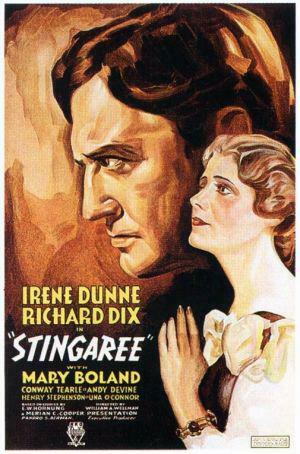 I first saw “Stingaree” back in 2007 when TCM aired it along with the other Marion C. Cooper films. For whatever reason, I didn’t write it down as a musical in my musical list- which explains why this is my 488 musical. When I revisited this film recently, I realized that it was categorized as a musical-and while it was not a flashy musical in the style of “Broadway Melody of 1936”-the film is much like “San Francisco” (1936). The bulk of the film is the romantic, melodramatic story sprinkled with quality operatic numbers. The story of “Stingaree” may be far-fetched, but I love this movie and think it’s a lot of fun. I guess you could say Stingaree the outlaw is like Robin Hood of Australia. Rather than stealing from the rich to give to the poor, he steals the rich people’s maid to make her an operatic star. It also has a few hilarious lines in it (see: Highlights). Irene Dunne is mostly known today for her comedic roles, but she had a beautiful singing voice in a few musicals during the 1930s. Though I love MacDonald, I’m happy Dunne was the star of this film. She brought the sweetness that was needed to Hilda. This was her second teaming with Richard Dix after “Cimarron” (1931). Frankly, Dix drove me crazy in “Cimarron,” but he’s charming and very appealing as Stingaree. Mary Boland plays her usual character as the fretting, dizzy and selfish woman. Her terrible opera singing is pretty hilarious. And as always, Henry Stephenson makes you want to give him a hug. I would honestly put “Stingaree” on your ‘must see’ list. For folks who don’t like musicals, the songs are not overwhelming. It’s a fun romp that is forgotten and under-appreciated. This entry was posted in Musical Monday and tagged Irene Dunne, Marion C. Cooper, Musical Monday, Richard Dix, Stingaree, William Wellman by Jnpickens. Bookmark the permalink. Love that clip from the film. As you say, Mary Boland is hilarious – as always. That scene with her singing is so funny! “Compassion for the outlaw!” I think I watched 3 Mary Boland films the same day I watched this one.